We partner with Crandall Partners to assist our clients with Organizational Human Resource challenges. Steve’s expertise includes Talent Assessment, Strategic Planning, Leadership Training, Mergers & Acquisitions, Board consulting and Executive Coaching. WilliamCharles partners with NPA Worldwide to provide a global recruiting platform for our clients. NPA Worldwide members recruit in virtually every occupational and industrial niche. As a Member of NPA we have access to a network of over 1,300 recruiters across six continents, enabling us to assist with all of our clients’ hiring needs on a local, national, and global scale. WilliamCharles utilizes the Pondera® Virtual Advisor (PVA), a web-based personality assessment tool that dramatically increases individual and team effectiveness. The tool provides leaders and hiring managers with an in-depth view of an individual’s preferred work style, source of motivation, and approach to learning and decision making. These elements strongly influence an individual's commitment to and “fit” with organizational goals and culture. This insight combined with data from resumes, interviews, reference checks, etc. assists organizations in selecting individuals who have a higher likelihood of being successful in the position and the organization. Use of the PVA allows the decision maker to greatly enhance the evaluation process and the accuracy of the decision. Chosen Resumes, LLC is WilliamCharles’ go-to resource for when candidates need assistance updating their professional information. 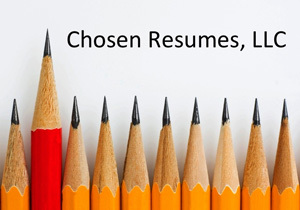 Chosen Resumes, LLC is a professional writing service that creates accomplishment-based, eye-catching resumes, cover letters, executive bios, and LinkedIn profile content. Based in Grand Rapids, Chosen Resumes, LLC work with clients from West Michigan and around the world across diverse industries and functional areas. They deliver direct, personal attention throughout the writing process to help take your career to the next level.